Although it is slightly out of my comfort zone because I feel more comfortable wearing pinks on the cooler side of the spectrum, I have been wearing strawberry-colored lippies and blushes quite often. But on my eyes? It is a total challenge. Sometimes I'd use a pale shimmery pink as a wash or a blending color, but I almost never wear a distinct pink on the lids. This crazy(?) idea came to me because my friend in Korea sent me a care package with this most amazing pigments set, which contained a sugared strawberry colored pot as well. The eyeshadow color doesn't look all that pink, right? 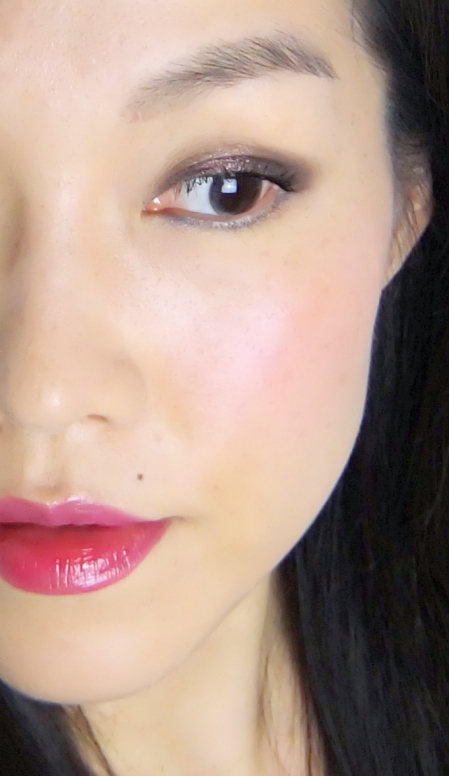 I was initially discouraged by the look when I wore the pigments by themselves since I looked like a drunk and sleepy woman, which is the usual case for me with pink eyeshadows. I had to blend it with my trustee black base, L'Oreal Voluminous Smoldering Liner. Still, it flashes enough pink to complement the cheek and the lip colors. This is awfully simple to do - I smeared the black base on my upper lash lines then packed the pigments on the lids. I used a clean blending brush to smooth out the harsh edges and applied mascara. On the cheeks, I am wearing Clinique Cheek Pop in Berry Pop (reviewed here). I am also trying a different blush position here concentrating the color more in the middle. 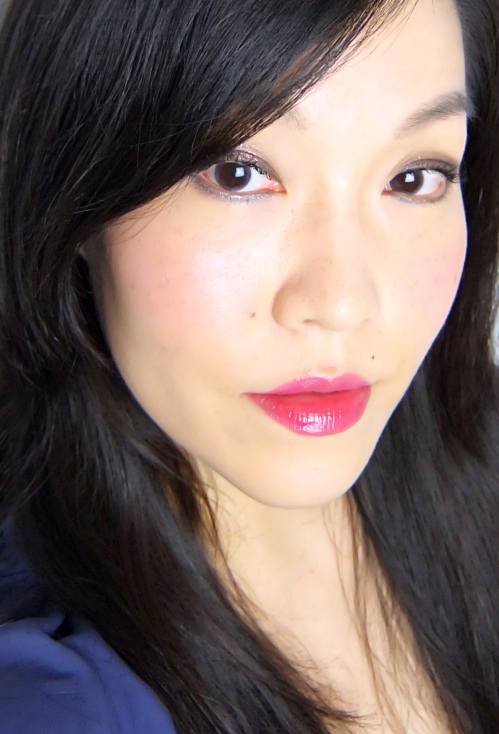 Revlon ColorStay Moisture Stain Barcelona Night (reviewed here) is a perfect example of a vibrant strawberry red, which I've been sporting a lot lately. I find the strong shimmer makes the warmer eyeshadow colors more wearable for me especially when I blend it with a black base to create a soft smoky look. Wish everyone a great week ahead! Hey Lena, this is such an adorable idea! You make me want to bust out my Clinique Berry Pop and maybe Guerlain Shalimar Rouge Automatique! Great idea mixing the pink with a black shadow. I think it has just the right amount of pink on the eyes so that it doesn't overwhelm the face with too much of the same colour. That Revlong lip thing looks smashing on you! I am encouraged by this and want to try all the "difficult" colors with black base to see what happens. Moisture Stain is really nice. It feels a bit drying at the end but still on the comfortable side, and I love the color. It's a very pretty eye look, Lena - I think it looks gorgeous over the black base (I still need to try this, but you know, I don't have any creamy black products any more). 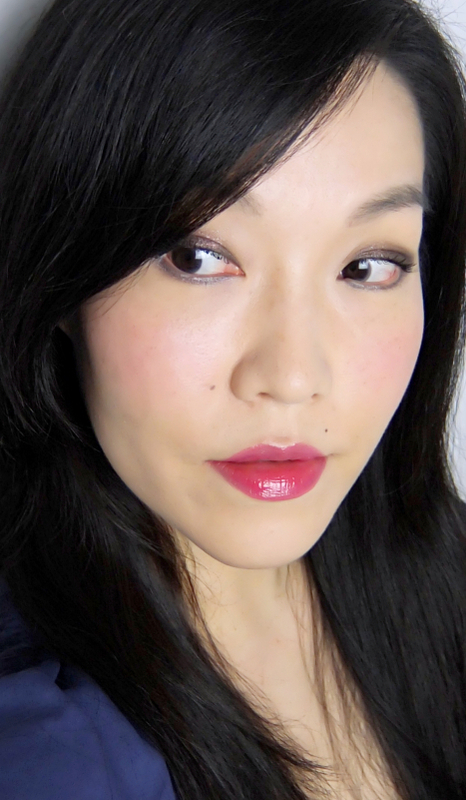 I was thinking about trying different blush placements lately, too, but I don't know if I can pull them off. Thank you, Larie. I am literally using the Smoldering liner every single day. It is not as intense or wet as the traditional kajal, so it is much easier to work with. this look is very pretty. I especially like the slight pink shimmery pigments on your lids. With the contrast of darker base, really makes the pigments pop. I loved the look, the lips and the cheeks are sooo beautiful! I totally need more strawberry pink blushes! SO pretty! Love the idea of the pink glitter over a black base. I have a Guerlain eye duo that has the same idea, just with shadows though. Actually, I think of you when I do wear that duo-it's kind of made for you! 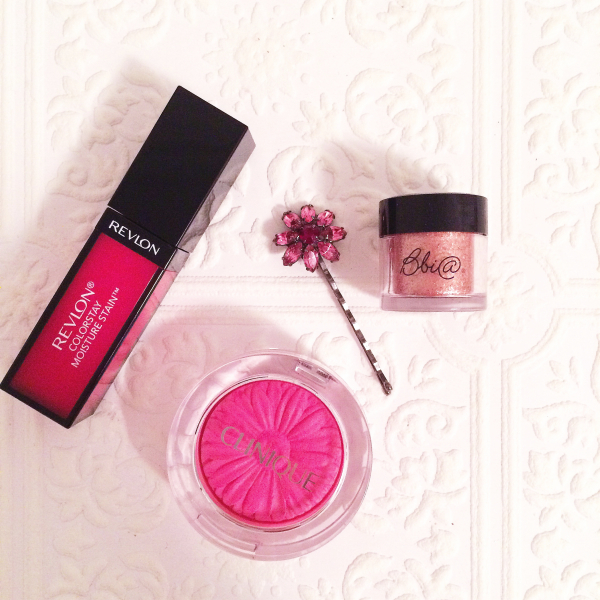 You are making pink shadow look very wearable with the way you layered your products for this look. Pretty! I love the look, Lena! I think strawberry pink looks very nice on you!! This new revlon hybrid lippie.. I've been reading a lot of positive reviews on it.. I am waiting until they're available in UK so I can put an order from Boots since they're now shipping to Germany yippies! Love the lip color it's gorgeous!